3614 Jackson Highway was released in the summer of 1969, was the first and last solo studio album for Atco, and was produced by Jerry Wexler, Tom Dowd and Arif Mardin. 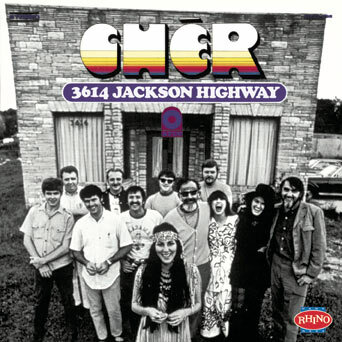 The cover is a photograph of Cher with the musicians who played on the album. They are: front row, left to right: guitarist Eddie Hinton, bassist David Hood, Sonny Bono, Cher, producer Jerry Wexler, background vocalist Jeannie Greene, background vocalist Donna Thatcher and producer Tom Dowd. Back row, left to right: lead guitarist Jimmy Johnson, producer Arif Mardin, drummer Roger Hawkins and keyboardist Barry Beckett. Missing were background vocalists Mary Holiday and Sue Pilkington. This disc is certainly Cher’s most ambitious project (at least for the ’60s) and was designed to bring Cher success after a period of crisis because 1968-1970 wasn’t a good period for Sonny & Cher and for Cher as a solo artist. The worldwide pop culture was moving on, but Sonny & Cher stayed in their original image and style. Pop music was transforming into a harder style marked by anti-war songs protesting the war in Vietnam. Cher’s and Sonny & Cher’s music didn’t really fit in. So their records weren’t really selling anymore. For months they had a nightclub act, but the audience response was less than positive. If the public response to this album was low, the criticism was ecstatic. Critics judged this as one of Cher’s best albums. A surprising element of the disc was the maturing voice of Cher, which showed more strength and versatility than in previous works. Another surprise was the sophisticated instrumentation and arrangements, which gave the disc a rock edge, along with Cher’s success in interpreting other artists’ songs.